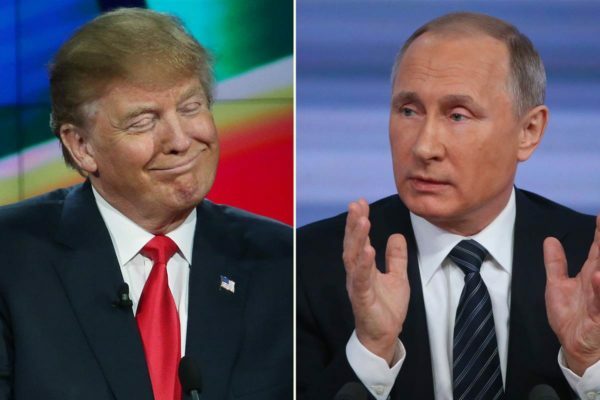 Vladimir Putin has described allegations Russia holds compromising material on President-elect Donald Trump as “utter nonsense”. The Russian president questioned what reason Russian intelligence would have had to spy on Donald Trump before he entered politics. Vladimir Putin said those making the allegations were “worse than prostitutes”. Memos published last week alleged Donald Trump’s election team colluded with Russia which also had salacious videos of his private life. The allegations claim Russia has damaging information about Donald Trump’s business interests, and that Trump had been filmed with prostitutes at the Ritz-Carlton hotel in Moscow during the Miss Universe pageant in 2013. Donald Trump has dismissed the memos, said to have been prepared by a former British spy, as “fake news”. Speaking in Moscow, Vladimir Putin also said the published documents were “clearly fakes”, published by those trying to “undermine the legitimacy of the elected president”. “When Trump came to Moscow, he was not a political figure, we were not even aware of his political ambitions,” he said. Vladimir Putin added that he did not see why Donald Trump would rush to meet prostitutes in Moscow, given he was organizing beauty pageants and meeting “the most beautiful women in the world”. Earlier, Russian Foreign Minister Sergei Lavrov said the UK ex-spy said to have prepared the memos is “some runaway crook from the MI6”. US intelligence agencies considered the claims relevant enough to brief both Donald Trump and President Barack Obama. Donald Trump accused US intelligence of leaking the content from a classified briefing – a claim denied by National Intelligence Director James Clapper. Vladimir Putin also said reports that Russian hackers had interfered in the US election were “fake news”, though he told people to keep in mind that “the hackers didn’t make anything up – whoever they were – they just uncovered material”. The hacking scandal dominated the US election campaign, with US spy agencies concluding Russia was behind the hacking and release of Democratic Party emails intended to damage the campaign of Hillary Clinton. Russia has consistently denied it. Signaling optimism that the US-Russia relationship will improve under the new administration, Sergei Lavrov said he was encouraged by some pragmatic comments from the Trump team so far. Sergei Lavrov said that Moscow was ready to co-operate with the new administration on key issues including nuclear weapons and Syria. US representatives have been invited to Syria peace talks in Kazakhstan next week but are yet to respond, he added. “I am convinced we will be able to restart a dialogue on strategic stability with Washington that was destroyed along with everything else by the Obama administration,” Sergei Lavrov was quoted as saying by Reuters. US-Russia relations have worsened significantly in recent years over the war in Ukraine, the Syrian conflict and cyber-hacking. Get your HGH injections right now!